The ‘politics of gender-responsive social protection’ webinar took place on 7 March 2019. The event discussed the transformative aspects of gender responsive social protection systems, which play a critical role in improving women’s and girl’s lives by addressing lifecycle risks and transitions, recognising unpaid care and domestic work, increasing access to services and infrastructure, and promoting women’s and girl’s voice and agency. Further, the webinar explored the political economy drivers and barriers to promoting gender-responsive social protection, given that the extent to which social protection is gender-responsive is as much a political decision as a technical one. The webinar was made possible by the joint efforts of the Overseas Development Institute (ODI), and the UK Department for International Development (DFID). The event was moderated by Rebecca Holmes (Research Associate, Social Protection and Social Policy Programme, ODI), who was joined by speakers Laura Alfers (Director, Social Protection Programme, WIEGO), Dr. Nicola Jones (Principal Research Fellow, Gender and Social Inclusion – GESI – programme, ODI), and Lía Limón (Founder of the programme on day care centers for working women’s children at the Ministry of Social Development, Mexico). The webinar recording is available here, the webinar presentation here, and the webinar Q&A session here. Nicola Jones opened the webinar by discussing the importance of a gendered political economy lens. The largely technocratic approach that has been pursued by most social protection experiences to date has limited traction in terms of advancing a transformative agenda in terms of equality and the empowerment for women and girls. Ideas are a key aspect of the way in which public policy discussions are framed, shaping the parameters of social protection policies and programmes. National social protection systems reflect different ideas about poverty and vulnerability and their causes, the purpose of social protection, and the role of the state and other actors in its delivery. When a gendered lens is employed, ideas may play an especially powerful role, as they are embedded in complex sociocultural norms surrounding understandings of family, care, and social reproduction. ‘Labelled’ cash transfers aimed at behavioural nudges offer some opportunity to draw attention to specific gender vulnerabilities (e.g. Ghana’s LEAP and UNICEF Jordan’s Hajati cash transfer). The cash plus approach for forcibly displaced adolescents focuses on cash plus child-safe spaces for girls and boys to protect them from all forms of violence (the EU’s Enhancing Rights programme in Central America). Expanding the framing of public works to include community education, investments in time-saving community infrastructure, and skills building (Ethiopia’s Productive Safety Net Programme, South Africa’s Public Roads Programme). The second pillar in the framework refers to institutions, understood as relatively enduring features of political and social life that influence behaviour and cannot be easily changed. This includes formal (elections, legislature, constitution, etc.) and informal (families, clans, Zakat, etc.) institutions. These sets of rules tend to be highly context-specific, and shape the opportunities and constraints surrounding social protection programming. Gendered outcomes are linked to the ways in which gender norms and practices are explicitly and implicitly embedded within these institutions, which are often deeply patriarchal in nature. The third ‘I’ refers to the interests of key actors who are likely to gain or lose from policy shifts (political elites, bureaucratic agencies, donors, civil society champions) and the relative balance of power between them. There is evidence of the increased willingness and urgency of elites to extend social assistance in contexts of political legitimacy crises, and social assistance is then seen as a potential solution. However, there are limited incentives for elites to push for gender-responsive social protection. Laura Alfers followed with an introduction of the Women in Informal Employment Globalizing and Organizing (WIEGO) organisation, a global network of membership-based organisations (MBOs) of informal workers, researchers and development professionals working to improve the status of informal workers, particularly women. WIEGO works to provide support for organisations of informal workers, supporting their representation in policy processes and conducting research and analyses. Drawing on empirical examples of organisations within WIEGO’s network, Alfers moved on to discuss the importance of the grassroots participation of MBOs in creating strong social mobilisation for gender-responsive social protection. 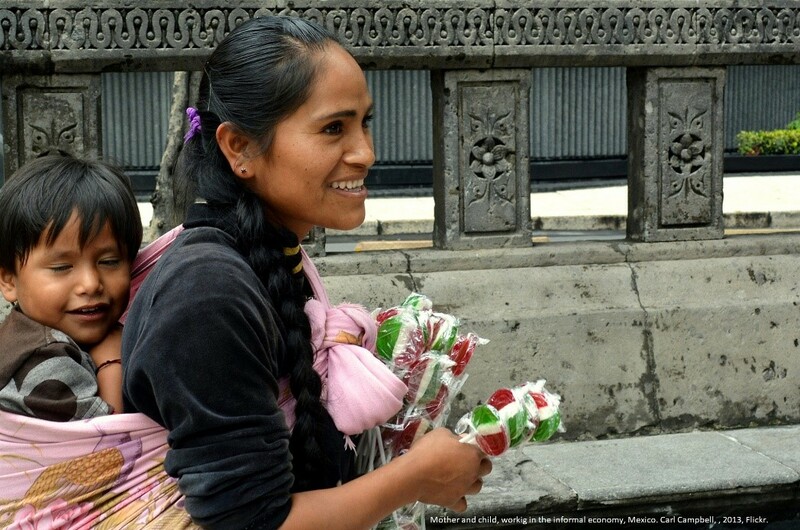 This process can push governments to think “from the ground up” about the design of social protection policies and programmes so that they better reach intended beneficiaries, considering the perspectives of informal workers. Further, the experiences of informal social protection mechanisms can challenge governments to expand their ideas on what is achievable within a social protection scheme. HomeNet Thailand, a network of home-based workers, who worked together with a civil society organisation, the Nine Network, and jointly campaigned for a Universal Coverage Scheme, taking advantage of an opening in the political space due to an election. The Kenyan Association of Street Vendors and Informal Traders (KENASVIT) and the extension of the Kenyan National Hospital Insurance Fund (NHIF) to incorporate contributions for informal workers. Asmare Waste Picker Co-operative and the development of an autonomous child care service in Brazil, which was later integrated into the national child care service. Tripartite spaces on social insurance include trade unions. Informal worker organisations – even if affiliated to the trade union – are not directly represented. Social assistance spaces are usually dominated by NGOs and “experts” – informal workers are not targeted, thus limiting space for engagement. The gendered politics of informal worker organisations: Marginalising women’s concerns such as maternity benefits and child care. Lia Limon explained that Mexico’s Estancias Infantiles Programme has existed for 12 years and has effectively been closed by the newly-elected Mexican government. The programme was launched in 2007, with the objective of reducing gender inequality and poverty by facilitating women’s entry into the labour market. Individual women were provided with cash grants to renovate and equip homes or facilities to operate as safe day-care centers. The beneficiaries were also trained to become better prepared to manage a day-care center and better attend to children. Subsidies were distributed to child-care centers for children under four years of age, destined for low-income working mothers. In a more advanced stage of the programme, low-income single fathers were also provided with support. The benefits covered part of the expenses of the day care. Mothers were responsible for paying the rest of the tuition. By 2012, 9,565 Estancias was providing care for over 330,000 children. However, the new administration in Mexico effectively closed the programme in 2019, withdrawing the support to Estancias operating in over 1,200 municipalities across the country. The mode of delivery has been changed to direct cash transfers to mothers that can be spent on any need. Despite Congress’ approval for a budget for the programme, the decision to dismiss the programme still occurred – a decision that faced great political opposition. The government argued that there were irregularities in the programme, without providing appropriate proof. These changes were met with fierce opposition by women’s civil society organisations and NGOs. The new direct transfers approach cannot achieve the same goals of the previous programme or substitute the previous programme. The new programme is targeted to indigenous people and high-poverty municipalities, which amount to 625 municipalities and 17 states of the country, out of 32. The previous programme was national, reaching 53% of the country’s municipalities. The new programme removes support for women living in poverty that come from an urban context. These women are mainly employed in the informal sector and therefore still in need of support. The benefit levels are lower compared to the previous programme. Benefits are not strictly directed to the support of day care centers. There were extremely strict supervision measures for the day care centers in the Estancias programme, an aspect that is excluded from the new programme.